NEW TO THE MARKETBIG PRICE REDUCTION...AGAIN!! !This is a rare find Ferretti. This is a one owner yacht with a discerning owner who is meticulous in upkeep on his yacht. The full beam master stateroom and custom hardwood floors in the saloon coupled with the full glass windows in each of these areas make this yacht open and airy with the best water views available. The owner is moving up, not out, and looking for his next yacht. When he purchased the yacht new, the sea trial was on a rough sea day. This is what sold him on the boat, the smooth ride and quiet interior while underway. He would consider a trade on a larger yacht in the 60 to 70-foot range. 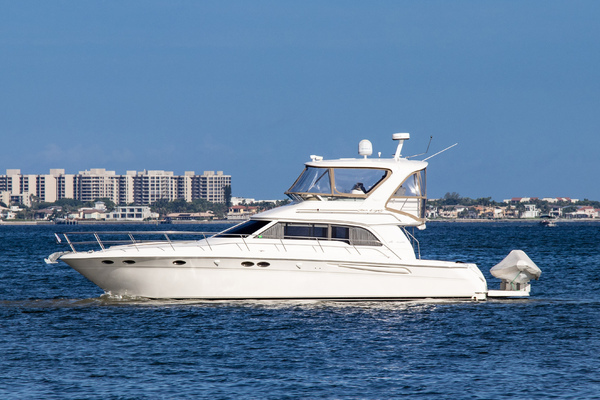 This yacht is easy to see and located at the beautiful Palm Harbor Marina in West Palm Beach, Florida. It is a joy just to sit on at the dock! Let this be your next yacht. United Yacht Sales New Jersey would love to guide you through a personal showing of this 53' Ferretti Yachts 530 2013. 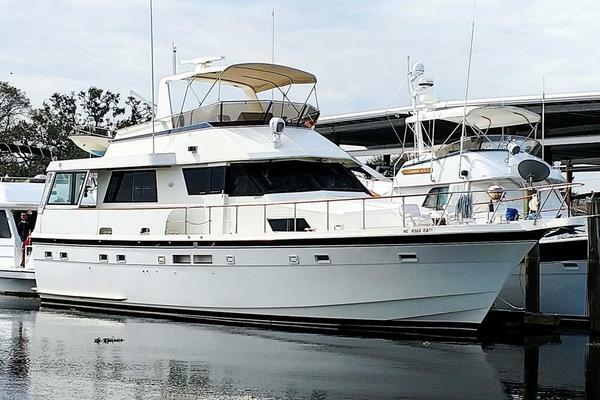 This yacht for sale is located in West Palm Beach, Florida and priced at $1,120,000. For a showing please contact us by filling out the form on this page and we will get back to you shortly! 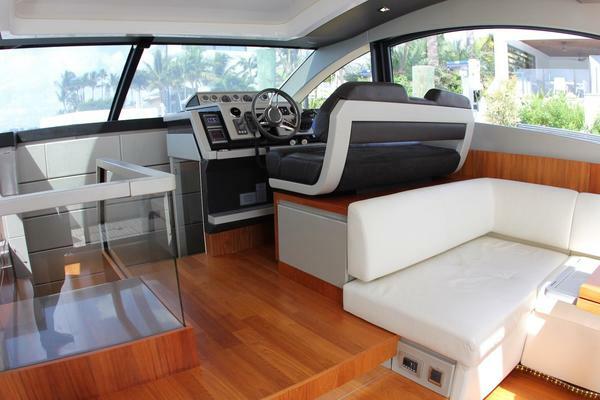 When you first enter the Ferretti 530 your first impression is that it seems much larger than 53 feet. This is because of the open plan with full volume view that allows viewing from helm station to stern unobstructed. This, along with the big oversized side windows, give this yacht a very large feel. Your first entry is on the teak floored aft deck with two bench seats with cushions and a teak Besenzoni passerelle that make “stern to” docking and boarding the vessel really safe and easy. This feature also doubles as the lift for the tender on the transom with a lifting harness that attaches to the underside of the boarding plank. Most times there are two deck folding chairs on the aft deck allowing seating for 6. Under the aft seat is an air-conditioned bunk room that can also be used for additional storage or converted to a crew quarters by adding a head as this was what the original design was intended.As you look forward you will see floor to ceiling glass on the center door and the port glass along the port inside salon wall. The slider door coupled; with the swing up window on the starboard side opens the full aft of the yacht. The second thing you will notice is the upgraded beautiful wood floors in the galley, salon and helm areas. The galley is also located on the aft starboard side of the salon, so the galley now becomes a focal point of activity on the yacht and creates a center for activity from the galley to the open aft deck. On the starboard side of the aft salon is a counter area for staging and below this is more storage.Moving forward into the salon on the starboard side is a sofa for seating of three with a pop up 32” flat screen color TV in the back. On the starboard side are an L-Shaped sofa seat and a hi-low extendable dining table capable of seating 6 when utilizing the custom folding Ferretti chairs stored in the aft compartment.In the forward corner of the open salon on the starboard side is the lower helm station with a helm seat for 2 complete with all controls at your fingertips to operate the yacht. This includes all breakers and activation station for power transfers and is complete with a fold-down footrest for the helm seat. Located on the dash are the instruments to include all gauges and navigation station with the Furuno Nav Net and the ZF engine controls along with the bow thruster. The best part of this area is the one-piece windshield that gives the Captain an unobstructed bow view as well as giving the room a 360-full ocean view!As we walk down the 4 step stairs into the stateroom area to the starboard are two single berths with a hatch on the side of each bunk with a hanging locker between them. Also, each bunk has a nightstand with private reading light and this quarter has its own A/C control. There is also a large mirror for the guest.Across the companionway is the guest head complete with sink toilet and hard enclosed shower. Behind the sink and over the counter are mirrors for ample prep views and there is a port light for fresh air next to the sink. Just above and behind the sink is a hidden vanity 2 shelf storage that is very deep for ample space. The head is a Tecma Vacu flush that is super quiet.Directly across from the guest head is an enclosed washer/dryer for making the stay on board convenient.Just forward of this is a queen berth VIP stateroom that at first glance looks very long due to the mirror over the bed. This stateroom is complete with hanging lockers on port and starboard sides. The VIP and the port guest share the forward head that can be used as a day head as well. In the VIP there are two drawers under the bed as well as two private bedside counters and each side has its own reading lights. The VIP stateroom also has an overhead escape hatch which has a screen and privacy shade for fresh air as well as large port lights on each side with openings again for fresh air. This room is very light and airy.Turning aft down the companionway aft you have the full beam master stateroom with a king-sized bed, hanging lockers on each side as well as 2 drawers under each of the nightstand tables with bedside lighting. Forward to port is the location of the private entry to the master head complete with a fully enclosed shower with a seat. In this area there is a vanity cabinet with ample storage, a nice mirror over the sink and a port light hatch for light and fresh air. The most impressive part of the stateroom is the very large hull side full view windows on each side. There is reclining seating on the port side of the stateroom with a full just above water level and ocean view. This gives this room a water view rivaled only by the main saloon it truly is magnificent. There is a color flat screen TV mounted on the forward bulkhead wall and Fusion AM/FM stereo with iPhone docking station next to the bed.Moving up the stairs to the flybridge you will note yet another dining table located on the aft port corner. This table has an expansion ring as to enlarge the area for bridge dining. Moving forward of this is the dry bar counter that could house either a grill or ice maker refrigerator but was left for storage with the current original owner. To the port is the double helm seating with full controls and a Furuno Nav. system as well as bow thruster controls and all gauges plus controls for the engines. This is all enclosed in a drop-down panel for easy weather-tight storage.Forward of the helm station is a very large sun pad big enough for 3 adults shielded by a windscreen. Overhead is a Bimini soft top that folds down for full sun or shade. All of the bridge seats and sun pads as well as the steering station have full covers.As we go back down and forward on the spacious side gangways we come to the forward seating large sun pad complete with weather cover. This is big enough for 4 adults. In the very front is the stainless-steel plow anchor with electric windlass complete with foot controls as well as helm and bridge controls and chain locker with 250 feet of chain and fresh water hose hook up.